Hector, Andromache and Astyanax. Sculpture by Benzoni, 1871. The Met Museum. As I was looking through my well-worn copy of Seneca’s Troades this morning, my husband remarked in passing that Seneca seems to be my philological equivalent of comfort food. Last week did happen to be a long and difficult one, but I was also thinking about Seneca in relation to Vergil as I am translating the Aeneid with an exceptionally talented group of students this semester. Even though Vergil points out time and again that Aeneas suffers many hardships while trying to found a new homeland in Italy, his fate is still far better than the vanquished Trojans who are left behind in that burning city. The women, in particular, who are divided up among the Greek warriors as plunder, are given special attention by Seneca in his play the Troades. now and he has postponed my time of distress. only dreadful things are still to come. one has nothing to hope for. Andromache, I think, is one of the most pathetic and tragic characters in the Iliad and the scene in which she and her son bid Hector farewell is one of the most poignant in the entire epic. She is equally worthy of sympathy in Seneca’s play and she puts the situation in perspective for the other Trojan women: suffering is individual and it is also relative. It is Vergil, later in his epic, that gives her a new story of hope, a future beyond Troy, with another man and another, entirely different, yet happy life. Andromache becomes an additional example of ruins in motion that I wrote about for my Seagull essay. Today I have something a little different to review, a play by the Czech-born British writer Tom Stoppard. This is a very short work, fewer than 100 pages long. But it is full of great humor and insights about love and relationships. When the play opens, Max and Charlotte are having a discussion about Charlotte’s recent trip to Amsterdam. It becomes evident to Max that Charlotte never went on any trip and it was all just a cover to have a clandestine rendezvous with her lover. Max commends Charlotte for making the trip seem as authentic as possible by bringing back souvenirs for her mother. We soon realize that the scene between Max and Charlotte are not really married but were acting in a play that was written by Charlotte’s husband, Henry. Stoppard plays quite a bit with drama and reality and oftentimes blurs the distinctions between the two as I noted in the first scene. We learn that Charlotte and Henry’s relationship, much like that of Charlotte and Max’s onstage relationship, has its issues. After Henry and Charlotte separate and marry other people, Henry makes an interesting observation about commitment; he believes that many people say they are committed in a relationship and never give it a second thought. But for a relationship to succeed, both parties involved must renew their commitment on a daily basis. He concludes, very astutely, that there are no real commitments but bargains that are constantly being made between lovers. The characters in the play are flawed and are trying, like everyone else, to figure out what love is and to find long-lasting love. They deal with their relationship issues with humor but also with golden nuggets of wisdom that they have learned through experience. One of my favorite speeches in the play is given by Henry to his young daughter about love. He uses the Biblical Greek word “to know” in his definition; “to know” someone in a carnal sense is a euphemism in the Bible but Henry feels that it is a fitting definition for love because it is through the flesh that we allow one special person to truly know us like no other. THE REAL THING is a quick yet thought-provoking read. If you want to add more drama to your reading lists then I highly recommend it. This play has also made me want to explore more of Stoppard’s works. 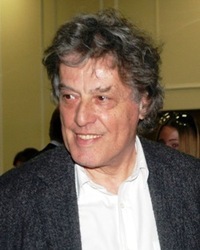 Sir Tom Stoppard OM CBE FRSL (born Tomáš Straussler; 3 July 1937) is a British playwright, knighted in 1997. He has written prolifically for TV, radio, film and stage, finding prominence with plays such as Arcadia, The Coast of Utopia, Every Good Boy Deserves Favour, Professional Foul, The Real Thing, and Rosencrantz and Guildenstern Are Dead. He co-wrote the screenplays for Brazil, The Russia House, and Shakespeare in Love, and has received one Academy Award and four Tony Awards. Themes of human rights, censorship and political freedom pervade his work along with exploration of linguistics and philosophy. Stoppard has been a key playwright of the National Theatre and is one of the most internationally performed dramatists of his generation. Born in Czechoslovakia, Stoppard left as a child refugee, fleeing imminent Nazi occupation. He settled with his family in Britain after the war, in 1946. After being educated at schools in Nottingham and Yorkshire, Stoppard became a journalist, a drama critic and then, in 1960, a playwright. He has been married three times, to Josie Ingle (m. 1965), then Miriam Stoppard (m. 1972), and Sabrina Guinness (m. 2014). I received a review copy of this title from The New York Review of Books through Edelweiss. As my regular readers know, I am a big fan of their line of classics. For more information on their titles visit their website: http://www.nybooks.com/books/imprints/classics/. I have to admit that when I found out that the translator of this ancient classic drama is not himself a classicist and does not know Ancient Greek I was rather skeptical. After reading the introduction to the work, however, I began to come around to the idea that Joel Agee was capable of giving us a modern rendition of this play while making it accessible to a 21st century audience. Agee describes his process of consulting older, literal translations as well as consulting experts in Ancient Greek philology. The result is an impressive translation of one of the oldest Greek dramas in existence. Prometheus is a Titan and in Zeus’ fight against the generation of Titans, Prometheus knows that Zeus will reign supreme and so Prometheus wisely takes the side of the god of thunder. Yet, after his defense of Zeus, Prometheus betrays him by stealing fire for mankind. As his name in Greek tells us, Prometheus is literally “forethought,” he knows what will happen before anyone else. So we might wonder why Prometheus chose to steal fire from Zeus and gift it to humans if he understands perfectly well that his punishment from Zeus will be long-lasting and most severe. When the play opens Prometheus is being chained to a rock by Hephaistos for his crimes against Zeus. Zeus is about to destroy man and create a new race of beings when Prometheus gives these pathetic humans the gift of fire. Fire allows them many things, including warmth, food, light, and civilization. Prometheus becomes the champion of civilized societies, artists and those who fight against any form of tyranny. One of the most interesting aspects of this play is the fact that Zeus himself is not a character and never speaks a word. Zeus’ thugs, or henchmen, which include Kratos (Power), Bia (Force), Hephaistos and Hermes speak on his behalf. The Chorus in the play is a group of water-nymphs, the Oceanids, who are horrified at and sympathetic to Prometheus’ sufferings. The other female in the play, which I have always found to be an interesting choice, is Io who also explains her path of suffering which is caused by Zeus. Io and Prometheus commiserate with one another and Prometheus, even though he is tortured, still manages to give Io hope about her own situation and her release from torment. It is Io’s progeny who will ultimately be responsible for freeing Prometheus. Prometheus Bound is not the most action oriented of the early Greek dramas yet, it is one of the more thought-provoking: Is Prometheus the champion of mankind who opposes all manner of tyranny or is he a dangerous revolutionary who challenges the authority that is necessary to maintain order and justice? Thanks to the New York Review of Books Classics series for providing us with another great translation of a classic. Aeschylus (525 BC–456 BC), the first of ancient Greece’s major dramatists, is considered the father of Greek tragedy. He is said to have been the author of as many as ninety plays, of which seven survive. Joel Agee is a writer and translator. He has received several prizes, including the Berlin Prize of the American Academy in Berlin in 2008 and the Helen and Kurt Wolff Prize for his translation of Heinrich von Kleist’s verse play Penthesilea. He is the author of two memoirs—Twelve Years: An American Boyhood in East Germany and, more recently, In the House of My Fear. 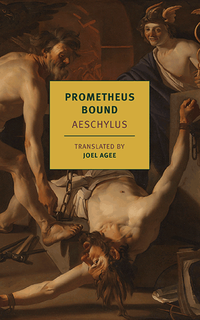 His translation of Prometheus Bound was produced at the Getty Villa in 2013. He lives in Brooklyn, New York.